A losing streak last month nearly dashed the Edmonton Oilers' hopes of returning to the playoffs. A recent surge, though, has them back in the thick of the race. Looking to further their postseason push, the Oilers will try for their fourth straight win when they host the Vancouver Canucks on Thursday. Edmonton (37-32-5) suffered a three-game slide from Feb. 16-22 that dropped the team to 14th place in the Western Conference. Since then, the Oilers have gone 10-2-0 to move to 10th place - one point behind Nashville and five back of Vancouver, Calgary and Colorado - three teams tied for sixth in the West. The Oilers opened a four-game homestand with an 8-4 win over Phoenix on Tuesday. Curtis Glencross scored two third-period goals and Ales Hemsky contributed three assists for Edmonton, which has won three straight and six of the last seven. "We were in a pretty bad situation not too long ago and made a commitment to each other and everybody has followed through with it," defenseman Steve Staios said. "We weren't feeling that good about how we were playing but no one went into panic mode. We had confidence that if we got back to our game that we could make a run." Rookie Sam Gagner added a goal and two assists, while Dwayne Roloson turned aside 26 shots in his third straight start for Edmonton, which scored eight goals for the first time since an 8-5 win over Columbus on Jan. 13, 2003. For the Oilers to reach the playoffs for the eighth time in 11 seasons after missing the 2006-07 postseason, they must capitalize on their eight remaining games - all against conference foes. Two of those matchups are against the Canucks (37-26-10), who have won two straight and five of seven as they seek to reach their sixth postseason in seven years. Henrik Sedin scored two goals, and twin brother Daniel Sedin assisted on both to give the Canucks a 3-1 home victory over Phoenix on Monday. "If you don't score and you're supposed to score, it's always nice to get some goals," said Henrik Sedin, who had been kept off the scoresheet in his previous four games. "We got some bounces and went to the net a little bit more (Monday night) and the whole team played better so it makes it easier." Roberto Luongo made 25 saves to improve to 5-2-0 with a 2.35 goals-against average in his last seven starts. 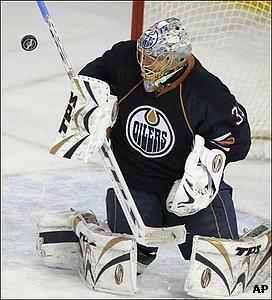 He is 3-0-2 with a shutout and a 1.74 GAA in five starts against the Oilers in 2007-08. The Canucks are 3-0-3 in the season series, but have lost two of three meetings at Rexall Place, where the Oilers have won nine of their last 10 games overall. Roloson is 11-11-2 with five ties, four shutouts and a 2.28 GAA in 33 lifetime games against Vancouver. Vancouver will be without rookie left wing Mason Raymond for four weeks after he suffered a second-degree MCL sprain on a knee-on-knee hit in Monday's win.